Karina's Kreations: Stampin'Up Santas List! Today is the start of the new Holiday Catalog entitled "Your Guide to Holiday Happiness!" It's a fabulous catalog filled with inspiring products to make your holidays easier!!! I'll be sharing some cards that I got as swaps over the next few days. This first card was designed by Tamie Ackerson. 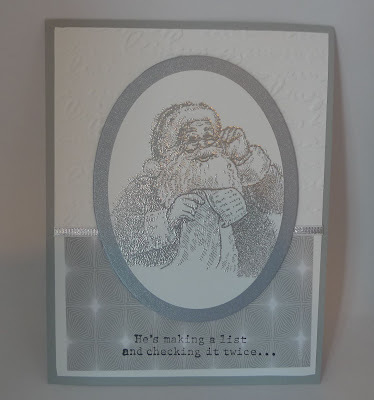 I love how she embossed the Santa with Silver Embossing Powder and used the new Silver 1/8" Ribbon on her card. If you love this project sign up for my newsletter and I'll email you instructions for an exclusive projects. Newsletters are sent two twice a month! Email me at kchin2@telus.net to get a copy of the Holiday catalog mailed to you!